Myopia (also known as near sight or nearsightedness or short sight or shortsightedness) is a common eye focusing problem, where the light rays that enter the eye are focused in front of, rather than directly on, the retina. Axial myopia: This occurs when the eyeball is slightly larger and longer from front to back. In people who have been diagnosed with pathologic or degenerative shortsightedness, the eyeball is so elongated that the shortsightedness becomes extremely severe. This condition usually develops by age 12, and is found in up to 2% of the population. Refractive myopia: This happens when the focusing mechanisms of the eye (cornea and lens) becomes too strong. In normal eyes, the cornea and lens converge and focus light rays directly onto the retina. In myopic eyes, the shape of the cornea or lens (or both) is too steep. This causes too much convergence and the light ends up being focused in front of the retina instead. An example of this how you become more progressively shortsighted when you develop a cataract. It’s pretty common actually! So you are in good company if you do need glasses for shortsightedness. It occurs in 20% to 70% of the adult population, depending on the race and country. It is most common among Asians. On a positive note, nearsightedness has been correlated with IQ and level of education – so the more myopic you are, the more intelligent and well-educated you should be! WHAT SYMPTOMS CAN YOU EXPECT FROM MYOPIA? You will experience blurry vision when looking at distances, but near vision will be good (picture below). If uncorrected, it may give you headaches, eye ache, tiredness and poor concentration. 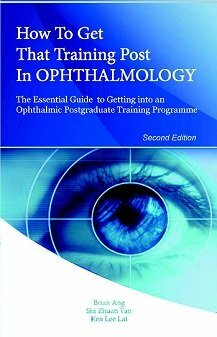 Those diagnosed with pathologic or degenerative myopia may suffer progressive and severe visual loss. There may also be bleeding at the retina due to abnormal blood vessels (like in age-related macular degeneration). Up to 20% of children have nearsightedness. This can affect your child’s ability to see well in school and during sports. Make sure you and your child attend regular eye checks to detect and treat any refractive error. Shortsightedness is not a disease that must be treated. The key thing is whether your vision and lifestyle is suffering due to your nearsightedness. Most people with short sight are quite happy that they can do close up work without the need for any correction. Many find that the distance vision is not so good, such as while driving, and hence the need to correct for the near sight.Fortunately, there are many ways, simple as well as invasive, to correct your shortsightedness. Spectacles and contact lenses are the commonest ways to treat shortsightedness. They are usually able to give good visual acuity for most cases of nearsightedness. Depending on the severity, you may need to wear them all the time, or only for distance use such as driving. These lenses are diverging lenses that refocuses light onto the retina. They have a minus sign, and are therefore imaginatively called minus lenses. The higher the number, the more myopic you are. For instance, if your short sight requires a lens power of -7.50 diopters for correction, then your shortsightedness is worse than someone who wears a -2.75 diopter correction. Left: In myopia, the light rays are focused in front of the retina, causing blurring of the vision. 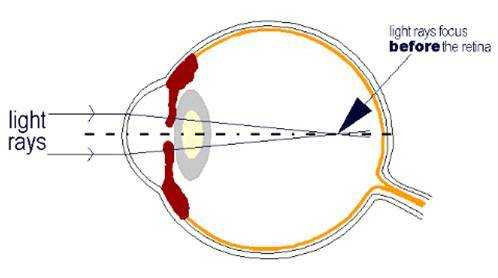 Right: A concave or minus lens placed in front of the eye helps to diverge the light rays so that they are refocused onto the retina and thus sharpens the vision. Orthokeratology is a procedure where special rigid cornea-shaping contact lenses are worn at night. These contact lenses reshape the cornea when worn. When the lenses are removed, the cornea remains at the new shape temporarily so you can see clearly without lenses during this time. Wearing the contact lenses at night allows you to have good daytime vision without the need for glasses. Phakic intraocular lenses are lenses that are inserted inside the eye in front of the natural lens. They do not replace the natural lens. Because they remain permanently inside the eye, no maintenance is needed. These lenses are appropriate for severe shortsightedness where other treatment options may not be suitable. However, this treatment is not suitable for everyone, and especially not for people with known glaucoma. Laser refractive surgery involves reshaping the cornea so that light entering the eye can be focused uniformly onto the retina. There are different techniques available, including photorefractive keratectomy (PRK) and laser assisted in situ keratomileusis (LASIK). In PRK, the laser removes micro-thin slices of your cornea. In LASIK, the laser creates and lifts a flap of cornea before remodeling the tissue underneath. The flap is repositioned once remodeling is complete. Wavefront technology now enables myopia correction to a very precise level. This means that you are unlikely to need glasses or contact lenses after laser refractive surgery. Complementary therapies range from eye exercises to acupuncture to herbal remedies. Most of these treatments help by alleviating the symptoms of eye strain from untreated refractive rather than permanently curing your myopia.